Magnum Marine is committed to building boats that use the latest technology and are environmentally friendly. For example, our boats use battery power for docking and maneuvering. Bottom paints are chosen so as to avoid contamination. Using marine LED solutions for lighting in our boats is another way that we support environmental sustainability. Read below for more information on lighting options provided by Lumishore. Lumishore builds the brightest, most beautiful, high-performance underwater LED lighting solutions for the marine sector using proprietary LED technology. Every Lumishore LED light is the result of an uncompromising approach to design, development, manufacture and a continuous search for cutting-edge lighting effects. Lumishore is ISO9001 certified, has ABS, RINA, DNV/GL Classification Approvals, and is the only underwater LED lighting provider with full Lloyd’s Type Approval including safety critical EMI/EMC testing and compliance. 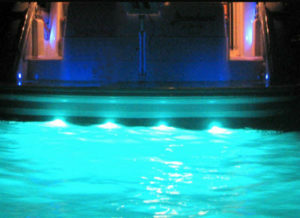 Lumishore designs, develops and manufactures its systems exclusively in Swansea, U.K. and has proven itself to be the premier supplier of underwater LED lighting solutions for all sizes of boats from RIBs to the world’s largest Superyachts. Complete in-house capabilities have enabled Lumishore to create exceptionally powerful marine lighting systems with the highest light output available from 1,100 to over 23,000 fixture lumens. Click here for more information on Lumishore’s latest products.